Almost two decades ago I created a piece for the inaugural exhibit for the Skirball Cultural Center, inspired in part by Charles Dickens’ Miss Havisham. At the reception, a couple asked me why I chose a theme that embodied such sadness to celebrate a happy event, and I responded "in longing there is hope." For me, the wax hands were always reaching, and therefore eternally open to the possibility of receiving love. Lately, on early morning runs during my first snowy winter in a long time, I've been noticing the delicate beauty of dead hydrangeas and other garden plants. Hydrangeas hold in their dried state the promise of what they may become again in spring, but with no guarantees. Seeing the latent possibilities is an act of hope. The opening of a cultural center was the culmination of an original act of hope. In the end, Miss Havisham repents for having chosen revenge over love, asks for forgiveness, and makes amends to Pip and Estella. This is also an act of hope, even though Pip and Estella (at least in the novel) never really have a happy ending together. As an artist, I live constantly in the longing / hope paradigm during the process of imagining and then creating work. Envisioning a piece is seeing the latent possibility of form and meaning in a world where the form does not yet exist. The act of making, sewing, photographing, or drawing may bring this image to fruition, but there is no guarantee that the reality will accurately reflect the original vision. Sometimes the real thing just doesn’t work, but sometimes it comes together beautifully. Rebecca Solnit, in her book Hope in the Dark writes that “hope locates itself in the premises that we don’t know what will happen and that in the spaciousness of uncertainty is room to act.” In these times, to create is both an act of hope and an act of resistance within which we are able to see what we might become. Although I am only at the halfway mark, The Blazing World, by Siri Hustvedt, has already had a major impact on me as an artist and a woman in my forties. I've not been able to stop thinking about some pretty big questions. What does it mean to be an artist, and an older, female artist at that? What is the nature of memory? What will be my legacy (although I don't plan on resolving that for quite a while)? Hustvedt's novel is a posthumous look at the life and career of a fictional New York artist, Harriet “Harry” Burden. The book is a compilation of excerpts from Harry’s own writings, interviews with family, friends, and art world contemporaries that attempt to form a cohesive picture of the artist through fragments of text and individual memory. It’s a really effective technique because structure and meaning of The Blazing World parallels the interest in memory and truth that informs Harry’s own work. Hustvedt sets the novel in the contemporary art world in New York at the turn of the 21st century, and it is a scathing indictment of this time and place in history, especially in its treatment of female artists. Harry, who was married to a very prominent art dealer, essentially goes unnoticed, both as a person and as an artist. After her husband’s death, she decides to not go gentle into that good night and instead concocts an experiment to see how her work would be taken if presented under the guise of a young male artist (or three). Predictably, this strategy works like a charm, but not without ramifications. I have not finished the book, so the exact toll this experiment takes on its participants is unknown, but suffice it to say that no one escapes untouched. On a personal note, as a practicing female artist in my forties, I can relate to Harry and her feeling of invisibility. Part of that is my own doing, as like Harry, I have not been knocking on doors and putting my work out there into the world. However, I definitely started to feel a change in the way I am treated and viewed culturally when I left my thirties behind. In spite of the celebrity magazine that trumpet “40 is the new 30,” there has not yet been a widespread shift in contemporary society. The art world also places a high value on youth. Having worked in the art world in the Los Angeles of the 1990’s, I can vouch for the obsession with the next hot young artist by the gallery system, and how these potential candidates for art stardom were snapped up and disposed of with ready abandon. I was fortunate enough to work with gallery owners who did not participate in this cycle and nurtured their talent, but it was certainly going on all around me. Some of the artists survived and prospered, but there were a lot of casualties that were never given the opportunity to make mistakes or mature into the great artists that they could have become. The third aspect of this novel that really got me thinking was about the practice of being an artist. Is just making art enough? Does the work, or I, need to be seen to have meaning? For Harry, her lack of recognition, marginalization by the art world, and the strong need to be recognized were the trifecta of frustrations that led to her drastic actions. Harry’s crisis has caused me to look for my own fine line of balance between pure pleasure from the act of making art and having what I have created seen and appreciated by others. From reading The Blazing World, I’ve realized that for me, while making still is the most important thing, participating in the greater dialogue of my peers in the art world carries more weight for me than I have previously acknowledged. So although I won’t be making any drastic changes, I will be poking my head out of the studio a little more often, and I look forward to seeing you all out there! Recently, in a bookstore, I happened to glance up and was arrested by the cover image (pictured above) of a photography book clear across the room. The book was Brassaï, Paris Nocturne. Nearly half an hour later, completely entranced, I left with a head full of Brassaï's captivating images of the external and internal environs of nocturnal Paris in the 1930s. Brassaï (given name: Gyula Halász) was born in Hungary, studied art in Berlin, and moved to Paris in 1924. Originally, he had little interest in photography, but took it up in his "desire to translate all of the things that enchanted me in the nocturnal Paris I was experiencing." His images of prostitutes, pimps, gangsters, and tramps as well as the buildings, streets and canals have a strong atmospheric presence highlighted by the electric, gas and neon lighting of the time. I love the blend of the documentary with the artistic in Brassaï's work. His images are not snapshots. Rather, he enlisted the people around him to form tableaux that still retain a feeling of naturalness. They are posed, but they are posed within the confines of believability. 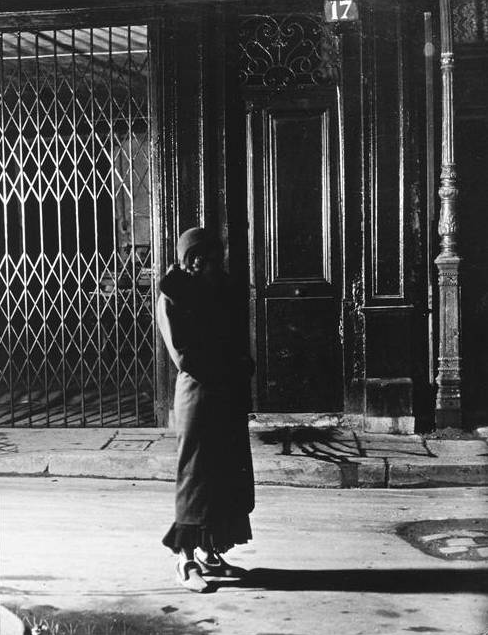 Also, Brassaï's deft use of lighting to bring out both the feeling and form of a place and it's people leaves me in awe. The mix of fog, rain, and light combine with mise-en-scène to give these photographs a very compelling, cinematic feel that has stayed with me ever since. Gerald Brockhurst was a British artist perhaps best remembered for his glamorous portraits of high society ladies such as Marlene Dietrich and Wallis Simpson, Duchess of Windsor. However, a large number of his paintings and etchings are of the women in his life - both his first wife Anais and his second, Kathleen Woodward, whom he renamed "Dorette" (pictured above). Brockhurst's style was very influenced by the works of 15th century painters such as Botticelli and Leonardo da Vinci, but the expressive, psychological power of his portraits are pure 20th century. The gazes of these women are full of intensity, whether it is projected outward at the viewer, or inward, as if the sitter is locked in a private reverie. Combined with moody, romantic landscapes in the background, these paintings pack an emotional wallop. Jeunesse doré is one of my favorite works. Not only because of the way Dorette staunchly emerges from the grey background of the landscape and clothing by the force of her personality, but I also love the contrasting softness that resides in her face. Brockhurst has captured a the complexity of a real person here, and it feels like we are looking at Dorette on her own terms. I'm excited to be speaking with some amazing fellow photographers on the ReProduce / ReImagine Panel at the SPE West Conference tomorrow morning in Humboldt, CA. My co-panelists are Jennifer Brandon, Christine Elfman, Kija Lucas and Meri Page. We will be discussing the making aspect of our photography practices - how we create the scenes, objects or narratives and then transform these creations through the act of photography. I'm very excited to launch a new window into my artwork! The journey to get here has taken a while, not least because I was very attached to the beautiful site that my dear friend and studio-mate Lorene Anderson built for me in 2005.